The cultural appeal of certain video games can vary greatly around the world, sometimes having vastly different receptions based on where the games were produced. In the 80s and 90s, before many video game companies founded their own international divisions, they often licensed their titles for porting to other publishers. And sometimes those publishers decided to go ahead and create their own sequels, independent from the original source. This article covers these such games. The act of licensing and publication can be tangled, so let’s go over what doesn’t qualify in this article. Games being outsourced to other companies outside of the publishers native territory does not count. For example, Contra: Legacy of War and C: The Contra Adventure were both developed in Hungary…but they were still produced and published by Konami. We are also mostly focusing on cases where the publisher bought the license for a game, ported it, and then made their own sequel. These are opposed to cases where the original rightsholder simply licensed the property to an overseas developer. 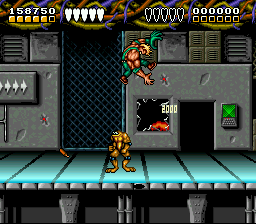 For example, Double Dragon (which we’ll talk about later on) – Tradewest produced Battletoads vs. Double Dragon, as they had previously published the NES port of the original Double Dragon, so this counts. However, the Double Dragon name was also licensed out to other developers without having ported the original game. Examples are the awful Double Dragon II: Wander of the Dragons for the Xbox 360 (developed by Korean company Gravity) and the goofy but fun Double Dragon Neon for various platforms (developed by American studio Wayforward). Generally, we aren’t counting these, though we’ll make notices of a few cases that might be interesting. Ms. Pac-Man is probably the most famous case of this phenomenon. 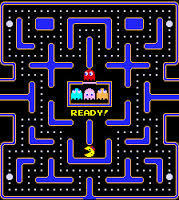 While the original Pac-Man was developed by Namco, it was distributed in North America by Midway. A group of programmers was working on a conversion kit for the game, called Crazy Otto, when they decided to go legit and approach Midway about publishing their game. They agreed, all of the characters were changed to Pac-Man ghosts and characters (including the eponymous lady Pac-Man), and created their own sequel. The complicated rights history between Midway and Namco means that Ms. Pac-Man infrequently appeared in Namco’s own retro compilations for awhile. Indeed, the arcade game was not actually released in Japan, and wasn’t even released in the territory at all until it was included as a mini-game in the SFC title Hello! Pac-Man (known as Pac-Man 2: The New Adventures in North America) in 1994. It was also included in Namco Museum Vol. 3 for the PlayStation. Broderbund’s Spelunker is one of those games that’s all but unknown in its home territory but hugely popular in Japan. Originating as an Atari 8-bit game, the license was purchased by Irem and the game was ported to the Famicom. As one of the early releases for the system, it sold extremely well and gained a substantially amount of notoriety due to its hilarious brutal gameplay. They followed this up by an arcade release, which was fairly similar, and an action-RPG for the Famicom, Spelunker II, which has basically nothing to do with the original game outside of featuring a spelunker as one of the playable characters. It appears to have been a completely separate game that they just shoved the Spelunker name onto to generate name recognition. After the death of Irem, the license was purchased by Tozai, who’s since used it to create several updates for the PlayStation 3, 4, and Switch. 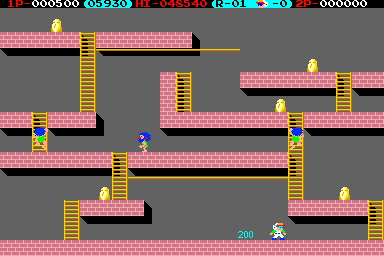 Perhaps owing to their success with Spelunker, Irem also licensed Lode Runner from Broderbund, where it became arguably more popular in its home territory. It started off as an arcade conversion, which was then used as a basis for various Famicom Disk System ports. While the original version was released on the NES on cartridge format, and there were a few for the Game Boy too, all of Irem’s successive games, including some for the PC Engine, remaining in Japan. Meanwhile, Lode Runner was later licensed to other American developers, including Sierra OnLine and GT Interactive, to create their own reboots. Yet another classic American computer title, Electronic Arts’ Boulder Dash was first picked up by Data East for a fairly straightforward port to the arcade for their tape system, before getting a revamp later down the line. Data East’s NES porting studio, SAS Sakata, also ported it to the Famicom, where it was released in North America by JVC. Meanwhile, Western sequels were being created by Mastertronic, who released an arcade sequel called Rockford, as well as several computer ports. Frogger‘s origins have been somewhat clouded due to all of the different international publishers. It was developed by Konami, but the arcade game was distributed by Sega in North America, and the computer ports were published by OnLine Systems and Parker Brothers. 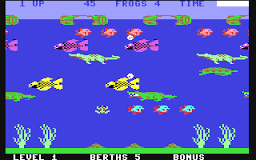 Parker Brothers created their own sequel, Frogger II: Threedeep, for various computers – the subtitle referring to the fact that there were three different screens instead of just one. The license went dormant for nearly a decade afterwards, until it was picked by Hasbro. Then it reverted back to Konami, who decided to create a mascot out of the frog and created a whole slew of spin-offs. Sir-Tech’s Wizardry is one of the formative computer playing games, with its first person dungeon crawling inspiring countless successive games. While the series was popular in North America in the 80s, its popularity petered off after 1992’s Wizardry VII: Crusaders of the Dark Savant. In Japan, however, it remained extremely popular, inspiring an anime OVA, novels, manga, and all sorts of spin-offs. Indeed, many of the home ports of Wizardry, including the NES ports, were developed in Japan. 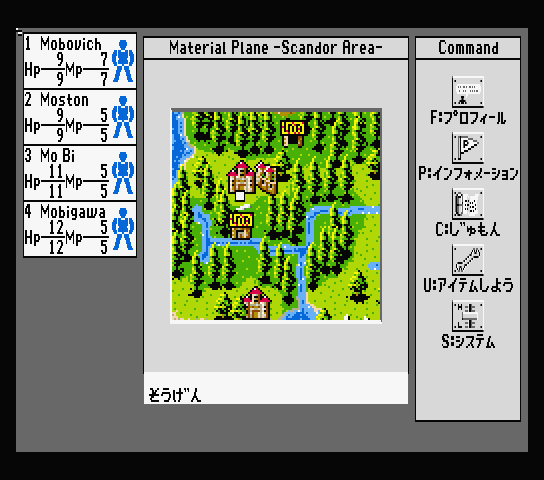 The original PC versions were released in Japan in 1985 by ASCII. After porting all of the main series, ASCII licensed and created their own titles, starting with the Wizardry Gaiden Game Boy games in 1991. These continued from other companies, including the Wizardry Empire games for the PlayStation in 2000 by Starfish, and Busin series by Atlus for the PlayStation 2 in 2001. The spin-offs go even further with the Ken to Mahou to Gakuenmono (“Sword and Magic School”) series, known as Class of Heroes in North America, which are basically Wizardry games given a cutesy, anime-style makeover. While most of these Japanese developed spinoffs never left the country, a few of them have been localized, including Wizardry: Labyrinth of Lost Souls for the PS3, Wizardry: Tale of the Forsaken Land for the PS2 (one of the Busin titles), and some of the Class of Heroes games. Phantasie is an Ultima-style RPG series from SSI. 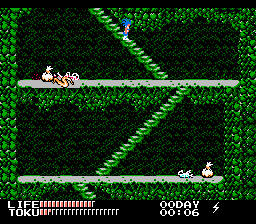 The first three games in the series were released in North American from between 1985 and 1987. A fourth game in the series, The Birth of Heroes, was developed and published by Starcraft, the company that had ported to the previous games to Japanese computers. It released in 1991 for the MSX2, PC-98 and X68000, and was never localized back into English. 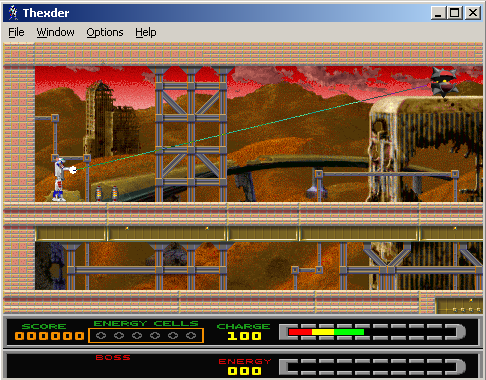 A British company named Tiertex was in charge of porting Capcom’s Strider to various home computers (as well as the Master System). During the development of another title named T. O. R. (“Transforming Overland Robot”), one of the developers decided to stick in the Strider sprite. They were then able to officially license the name and character from Capcom, so they went on to create their own unique Strider sequel. This was heavily revamped and released in both North America and Europe under the name Strider Returns, for the Genesis, Game Gear and (in Europe), Master System. Of course, other than the main sprite and a few other things ripped from the arcade game, it barely resembles Capcom’s classics, and is indeed quite a poor game. Neither Capcom nor Sega (the developer/publisher of the Genesis port of the first game) had anything to do with it, as it was published internationally by US Gold. This is sort of a similar case to Strider, as it involves the same companies, though it was actually developed first, in 1989. Tiertex had developed the European computer ports of Capcom’s Street Fighter, and decided to use that concept to create their own sequel. However, unable to get the license from Capcom (they would create their own sequel eventually), they just created it as a separate product under the name Human Killing Machine. As one might expect, it features a whole slew of national stereotypes, most quite a bit more outrageous than Capcom’s official roster, including a prostitute from the Netherlands, a matador from Spain, a waiter from Germany, and a terrorist from Beirut who has a missile strapped to his back. Unlike Strider II, it was never ported anywhere else, so it’s not as widely known, but if it were, it probably would’ve been just as hated. 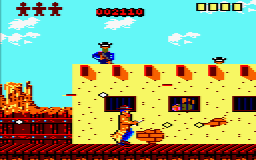 For some reason, the Amstrad CPC port of Capcom’s Gun.Smoke, developed by Topo Soft was renamed Desperado. They ended up creating their own sequel called Desperado 2, even though it had little in common with Capcom’s game other than the Wild West setting. 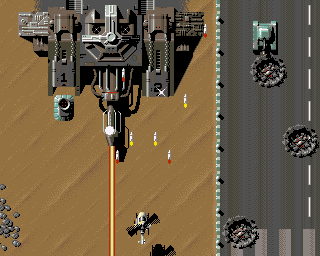 Gun.Smoke/Desperado uses an overhead perspective and plays like a shoot-em-up, while Desperado 2 has just two stages: a side-scrolling stage and a first person shooting gallery. 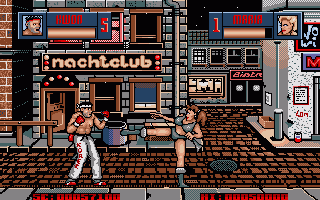 Technos’ 1985 arcade game Nekketsu Kouha Kunio-kun basically started the belt-scrolling beat-em-up genre. When localized for releases outside of Japan, it removed the Japanese high school delinquent setting to a urban gang theme, based on the movie The Warriors, and called it Renegade. Technos then branched off this in different directions – further games based on the Japanese version were part of the (extremely expansive) Kunio-kun series, while further games based off of the American version became known as Double Dragon. There’s a third splinter though, thanks to Ocean, who had published the computer ports of Renegade and developed two more sequels: Target: Renegade (also ported to the NES and released in North America) and Renegade III: The Final Chapter. The third game had some crazy ideas, particularly since it involves you traveling through time and punching mummies (though perhaps not too crazy, since Double Dragon III featured something similar, minus the time travel), but ultimately these were poor even compared to Technos’ own games. Speaking of Double Dragon, there are a whole ton of these. While Technos was aware of the series popularity in North America, they seemed to be more interested in cultivating the Kunio-kun series, so instead they just licensed the name out to pretty much anyone. The first taker was Tradewest, publisher of the port of the first game for the NES, who also published Rare’s Battletoads. They put the two together to create Battletoads & Double Dragon: The Ultimate Team. (Though despite featuring the stars of Double Dragon, it really feels more like a Battletoads game, in play style and setting). Later on, they created the one-on-one fighting game Double Dragon V, developed as a tie-in with the American cartoon series. This was quite poor in comparison. 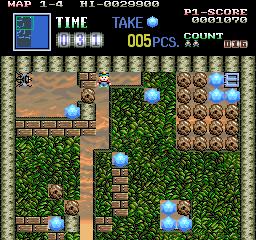 Bombuzal is an amusing action-puzzle gale developed by Image Works, and originally released for various European computers. Kemco licensed the game for release on the SNES, where the US version was renamed Kablooey! 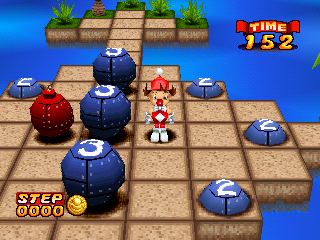 Kemco then created two more games: The Bombing Islands for the PS1, using their Kid Klown character, and Charlie Blast’s Territory for the N64, a similar game with different characters. The former was developed by Kemco themselves in Japan, the latter was done by Realtime Associates in America. Stuart Smith was one of the pioneers of early computer role-playing, with a trilogy of games: Fracas, Ali Baba and the Forty Thieves, and The Return of Heracles, along with the Adventure Construction Set and its accompanying games, Rivers of Light. Starcraft published Ali Baba in Japan, and then used the engine to create three more games: Tokyo / Battle King, Shanghai, and Kowloon Island. What’s interesting is that Smith’s own games borrowed from history and mythology, rather than Tolkien or other swords & sorcery fiction. The Japanese games use similarly non-typical settings, typically set in the future, even though he wasn’t involved with any of these. Owning to the Famicom adventure game boom started by Portopia Renzoku Satsujin Jiken, various companies licensed American computer games for porting and release in Japan. Kemco, often working with overseas companies, published Icom Simulation’s MacAdventure series, including Shadowgate, Deja Vu, and Uninvited, all of which were released in the US. Icom created their own sequel, Beyond Shadowgate, for the TurboGrafx-16 CD, before going out of business. Then Kemco obtained the license to develop and publish their own Shadowgate 64, which also released internationally. Other than the medieval setting and first person perspective, the Nintendo 64 game had little in common with its predecessors. 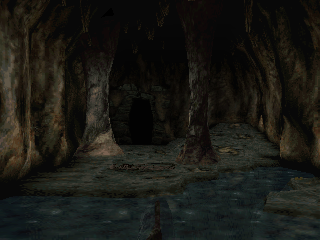 Drakkhen is a computer RPG featuring a 3D overworld, which was ported to the SNES by Kemco. 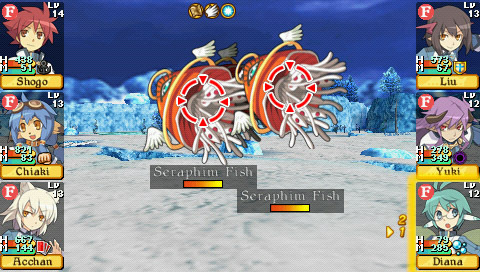 The game must’ve been fairly popular in Japan, as Kemco then created their own sequel called Super Drakkhen. 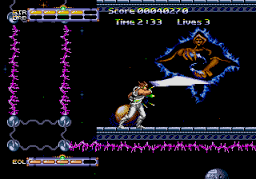 Other than sharing the 3D map, much of the game is presented as a typical side-scrolling action game. In other words, it has very little connection to the original game. It was released in North America under the name Dragon View, ditching the Drakkhen name totally. Silkworm is a side-scrolling shoot-em-up originally developed by Tecmo, where one player controls a helicopter and the other controls a jeep. The computer ports were developed by The Sales Curve, who then used the two-vehicle shooter concept in their own series dubbed “SWIV“. In other words, they basically ripped off the concept but changed the name just enough so that they didn’t need the license while still maintaining some level of familiarity. (The manual describes the acronym as meaning both “Special Weapons Intercept Vehicles” and “Silkworm IV”). The main difference is that the SWIV games use an overhead perspective. This spawned a few other games, including Super SWIV / Mega SWIV (known as Firepower 2000 for the American SNES release) and SWIV 3D for Windows and DOS, which uses a voxel-based 3D engine. It’s arguable whether this example really counts, because it was so pervasive, but we’ll include it for completion’s sake. 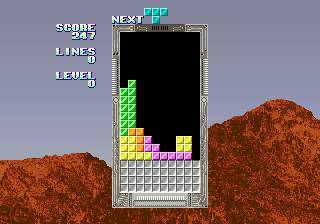 Tetris was, of course, created by Russian game designer Alexey Pajitnov, and was licensed (and sub-licensed) out to numerous publishers for release on computer and console platforms. Most of these publishers ended up creating their own sequels independently of Pajitnov – Sega created spin-offs like Flashpoint, Nintendo releases Tetris II, and Spectrum Holobyte made Super Tetris. Pajitnov was involved in several later similar games, to varying extents, including Hatris and Faces…tris III. Eventually the right reverted to him in 1996, where The Tetris Company was established, allowing stronger control over the game’s license while ensuring Pajitnov made appropriate royalties. Anyway, since Tetris was so popular, many other developers also prowled for similar clone games from independent developers, bought the licenses, and then made their own games. Sega’s Columns was originally by Jay Geertsen ; Data East’s Magical Drop was based on a DOS game called Drop Drop made by Russian studio Russ Ltd., and Konami’s Hexion is based on David Markley’s Hextris. Here are two Jordan Mechner titles, where again it’s arguable about whether these games really constitute sequels. Karateka was his popular cinematic karate action game, which received a (rather poor) port to the Famicom in Japan by Soft Pro. Shinpei Industry Co., Ltd then released a Game Boy version called Master Karateka, which makes various enhancements. Soft Pro and Shinpei may not be related, but it’s still interesting case to bring up. 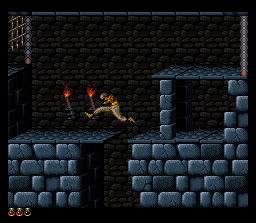 Mechner’s next game, Prince of Persia, was ported to almost every system at the time. 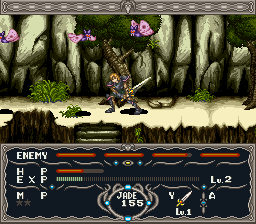 A prolific company Arsys ported the PC-98 title, then later worked on the Super Famicom version. It ended it so drastically expanded it that it may have been a sequel. Unlike Master Karateka, the SNES Prince of Persia was released in America, by Konami. The Japanese version was released by NCS / Masaya. 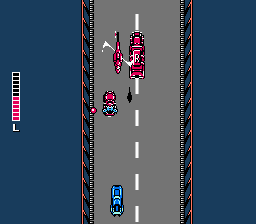 Sunsoft developed a Famicom vertical shoot-em-up called Battle Formula, featuring a black car driving along roads, that looks an awful lot like Spy Hunter. Since they had released the NES port of Spy Hunter a few years prior, for the American release, they used it again, releasing the game as Super Spy Hunter. Despite looking like the classic arcade game, it doesn’t actually play much like it, though. Breakout is the 70s Atari game where you control a paddle at the bottom of the screen, bouncing a ball back and forth to break bricks near the top. 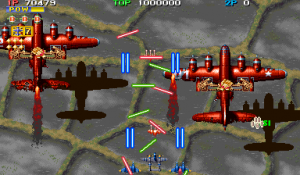 It inspired a whole genre of games, particularly in the arcade, as well as numerous clones. In Japan, this genre is games is called “block kuzushi” (“block breaker”) What may not be as widely known is that Taito actually licensed Breakout for Japanese arcades, including reskinning some of Atari’s games, like releasing Super Breakout as Zunzun Block. 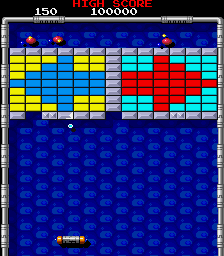 So Taito’s Arkanoid series, which revamps the visuals and adds in power-ups, initially released in 1986, isn’t actually just a Breakout rip-off, but is (sort of) officially a sequel to Atari’s games. Sierra OnLine briefly experimented with publishing Japanese PC games in the Western market, striking up deals with Falcom and Game Arts. Thexder, featuring a laser-shooting robot, was one of the most popular PC games at the time in Japan, so this was a suitable candidate, and they even localized the sequel, Fire Hawk. Nearly a decade later, Sierra created their own sequel, simply called Thexder, made to run natively in Windows 95. US Gold handled the European computer ports of OutRun and Turbo OutRun, and so followed this up with their own game, OutRun Europa. Though it was ported to both the Master System and Game Gear, only the portable version made it to North America, and none made it to Japan. It definitely feels off compared to Sega’s outings, as it has more of a spy movie chase theme, in addition to featuring several vehicles. As usual, it seems like it was initially unrelated racing game that got the OutRun logo stapled on. 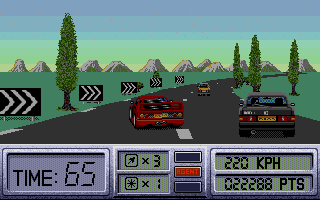 OutRun was seemingly very popular in Europe, as there were two Japanese-developed Master System games, Battle OutRun and OutRun 3D, that were only released there.